Colony just sent through Brandon Van Dulken‘s new 2015 BMX video that’s packed full of some serious street and skatepark destruction. Brandon goes fast and knows all about style. Hit play because you will not be disappointed by this! “Brandon is a man with skills on a bike that some of us only dream of. He can ride anything put in front of him and chances are he will be going full speed at it. The Northern Embassy coming through with a short, but sweet new BMX video featuring Amos Franke and Brandon Van Dulken getting down on the plaza in Vancouver! This one has a bunch of grinds and plenty of style! Enjoy! The Chilling Spree crew just dropped this new mix of footage they had featuring Riley McMaster, Carl Arnett, Drew Morton, Logan Mane, Brandon Van Dulken, James Dean and Jordan Hango getting down on some of their local street spots. This has a pretty chill vibe, but there’s plenty of gold in it! The Northern Embassy dropped this dialed new mix from the Cloverdale park in the BC! With a crew like Brandon Van Dulken, Matt Desson, Barrett Skylerchuk, Travis Sexsmith and Mat Ridgeway, you know things are going to get good! Check it! Wow… Colony‘s Brandon Van Dulken coming in with some SERIOUS cement park destruction! Check out some heavy clips he stacked at a handful of parks as part of a promo for his signature Roaster bars (which, the name, makes total sense after seeing this video) that are out now! “Brandon spent a week travelling around Oregon riding some amazing parks and camping in some great locations, here is the video from the trip that was shot and cut by Shawn Duffield. Colony dropped some info on Brandon Van Dulken’s new signature Roaster bars for you guys. 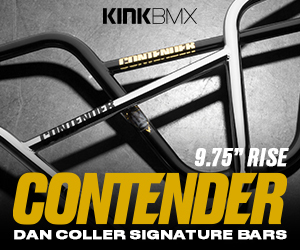 These fully post-weld heat-treated 4130 chromoly bars have a unique multi-butted tubing Colony designed specifically for these bars to make them extra thick at the grip bend by the cross bar to help resist bending and given the crossbar a larger diameter and higher placement for even more strength. The Roaster bars have an 8.75″ rise, 29″ width, 10.5-degrees of backsweep, 2-degrees of upsweep and will come in colors of gloss black and chrome. Weight is yet to be announced. Expect more details on their release. Colony dropped this brand new mix edit featuring their team riders from around the world dropping some damn good clips for you to enjoy! Really digging all of the different styles from the streets to the trails to technical front brake riding all in one! “We wanted to start a video project featuring as much of the team as possible and with as much diversity possible. Here is the first of many Collective’s. Brandon Van Dulken has been on absolute FIRE this year. Here’s his latest edit for Colony that’s filled with heat from all of the traveling he has been doing lately! This is one you won’t want to miss!